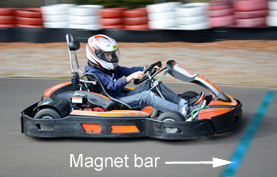 Many karting tracks have already their own magnetic bar/strip for the activation of the embedded chronometers like 'Alfano'. Our transponders RC3 Karting work perfectly with these bars/strips. However, elements of magnetic bar are available in our online shop for the people who want to install one on their circuit. The bar must cover the entire width of the track (up to 8m40 = 27.6ft). It consists of 60cm elements put end to end (no space between them). No power supply or wire is required for its operating. Note : The waterproof hose available in our webstore can protect the bar from weather conditions for temperatures between -10°C and +50°C.